A Duniway school value is courage, and seven-year-old Naomi has shown great strides this year, using The Shadow Project to set and achieve goals. Sharing with the class, taking turns talking with a friend, reading out loud in front of a group, listening as others read, and raising your hand are all ways to show courage in second grade at Duniway. Because Naomi has been identified as needing to work on her social skills, Learning Center Teacher Erica Warren and Classroom Teacher Julie Aquilizan use The Shadow Project’s innovative goal setting program to help Naomi set and achieve her goal of exhibiting courage. 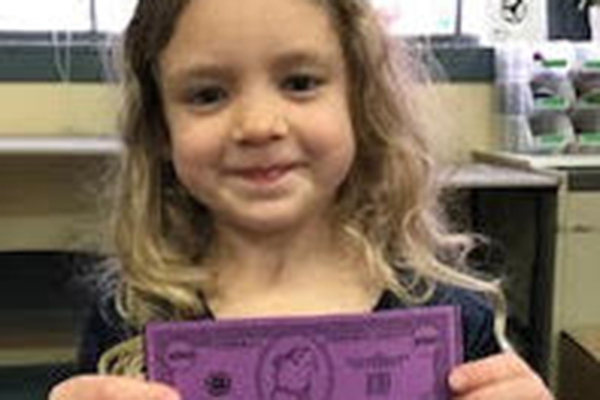 With her eye on a bright pink squishy beanbag chair from the Shadow Store, Naomi steadily earned Shadow Bucks every time she completed a skill for her efforts on courage, as well as completing work in the Learning Center. It took her two months, but she persevered, saving $100 Shadow Bucks, for her special chair. The Shadow Project began in two Duniway classrooms. Now in its 15th year, Shadow has helped foster success for more than 11,000 children.